Newbery Medal winner Erin Entrada Kelly (Hello, Universe) is known as a writer, but she is also an artist—incessantly sketching in her notebooks as she works out an idea for a new novel. 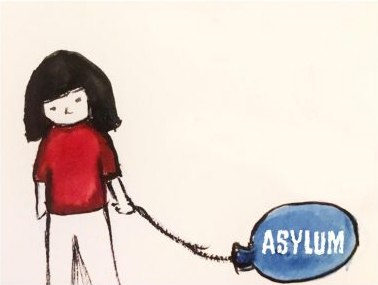 She recently created an illustration for Raising Our Voices Today, the latest group from the children’s publishing world to organize for advocacy. Kelly's illustration for a Raising Our Voices Today poster. 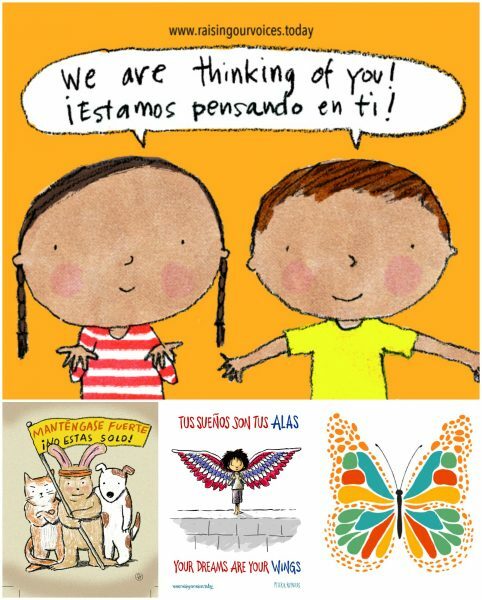 Authors Holly McGhee and Julie Burstein created Raising Our Voices Today to share images by children’s illustrators that could be used on posters for the June 30 Families Belong Together marches around the country to protest the separation of migrant families who crossed the U.S. border illegally. The images were free to download, print, and be carried at the rallies. Kelly, whose mother came to the United States from the Philippines before Kelly was born, has written about the lives of immigrant families in her novels. She didn’t hesitate to help out with this project. “Holly McGhee asked if I wanted to get involved and I gave a resounding yes,” Kelly wrote in an email. “The xenophobia, irrational fear, and myths about immigrants need to be challenged at every turn. It’s important to remember that people have been spreading fear and misinformation about immigrants since this country was founded. If those beliefs had not been challenged, we would have turned away Catholics, the Irish, Germans — [President] Trump is the grandson of German immigrants, lest we forget—and countless other groups.” As for her drawing, Kelly explained, “I wanted to depict the innocent young people being affected by xenophobia and their cautious hopes of something better.” The group also started a postcard initiative, offering a series of postcard images on the website to print for free, and asking people to send the postcards to kids separated from their parents and currently living in detention facilities. Some of the images designed for Raising Our Voices Today postcards. In addition to Kelly, participating artists include Jennifer K. Mann, Peter H. Reynolds, Alison Farrell, Sujean Rim, Edel Rodriguez, Christopher Weyant, and Marc Rosenthal.